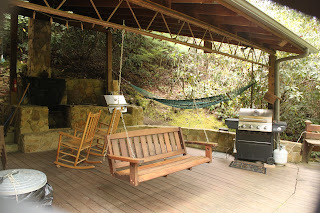 Best Lodging close to the River -web site"click here"
Wilson Creek is a freestone stream that comes to life in Avery County along the slopes of Grandfather Mountain in the Pisgah National Forest. From it’s headwaters to the confluence with John’s River in Caldwell County, Wilson Creek drops several hundred feet and flows some 25 miles. 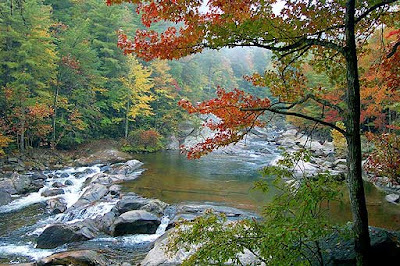 Wilson Creek was named a Wild and Scenic River in August of 2000. Nice size water for the fly flinger to enjoy! 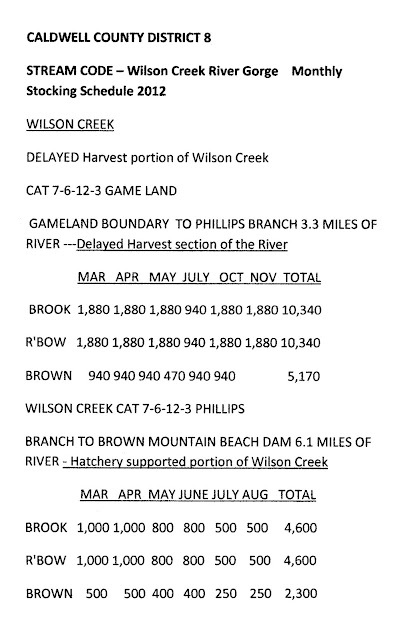 Basically you can divide Wilson Creek into 4 sections. The upper section is regulated as Catch and Release Artificial Lures Only. 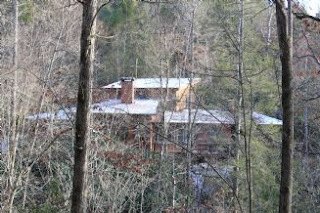 This upper section is defined by large boulders and plunge pools. This section requires anglers to hike/walk into the remote sections of the stream. 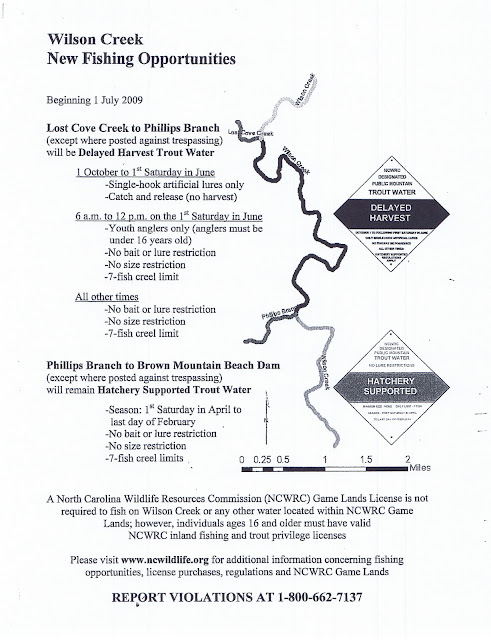 Lost Cove Creek, one of the major tributaries, is regulated as Catch and Release Artificial Fly Only water. Lost Cove marks the lower boundary of this section. From just below Lost Cove down to Phillip’s Branch, which is just downstream of Harper Creek is regulated as Delayed Harvest water. This section is very heavily stocked with over 10,000 fish stocked each year. This section is much flatter than the upper section and has some large slow deep pools. Harper Creek is a major tributary in this section, it’s regulated as a Wild stream and offers the visiting angler the opportunity to hit some Wild water after they “tune up” on the fish in the DH waters. The next section is about 7 miles long and is regulated as Hatchery Supported trout water. 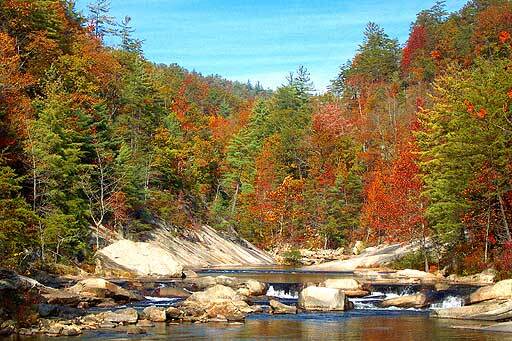 This section includes the Wilson Creek Gorge which is one of the premier whitewater kayaking runs in the southern US. This section is the most visited part of the stream, with lots of swimmers, tubers, sun bathers etc. This section is BIG water with lots of deep pools and some Class III and IV rapids. 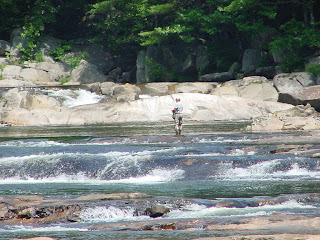 The lower stretch of Wilson Creek below Brown Mountain Beach to John’s River is very marginal trout water and is a smallmouth bass fishery. Some great smallmouth bass action can be found here and with so much water close by it’s often over looked by the visiting angler. Blue Winged Olives and Black Stone flies are the primary hatches throughout the spring. Starting in April you’ll find big hatches of Hendricksons and Caddis flies. Spring is a great time of year to fish Wilson Creek since you’ll pretty much have the place to yourself. Summer months can be challenging to the fisherman on Wilson Creek. The water warms, the crowds grow and the fish activity slows. Once the Caddis flies begin to tail off you’ll still find a good concentration of Stoneflies and Light Cahills and like all streams in NC terrestrial flies like the ants, beetles, and hoppers can be very effective. The fall and winter fishing on Wilson Creek can be be INCREDIBLE! From streamer fishing the gorge for big browns, to stalking wild fish up high to testing your skills on the Delayed Harvest section, Fall/Winter fishing offers great opportunities for the visiting angler. Typical hatches include Blue Wing Olives (BWO’s) and black stone flies and your typical midge nymphs throughout the season. 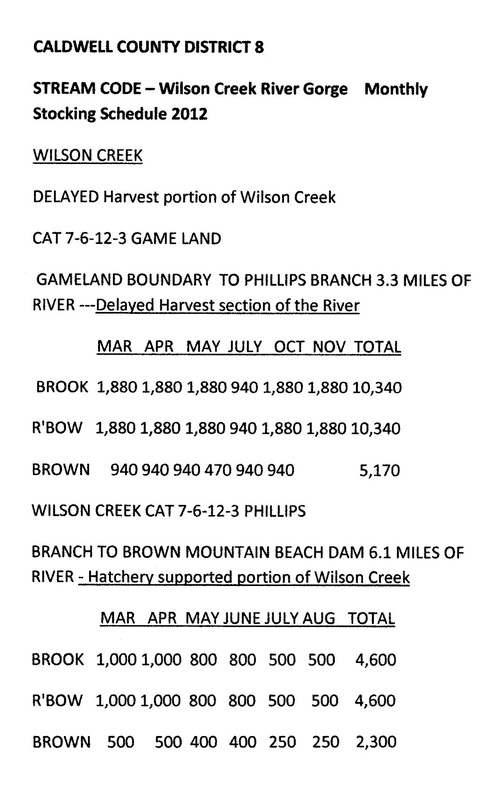 Wilson Creek Outfitters Website portal for the latest info on Wilson Creek fishing "click link here"
between 30 minutes after sunset on May 31 and 6 a.m. on June 1.
open for all anglers under Hatchery-Supported regu la tions. These waters are marked with black-and-white signs. 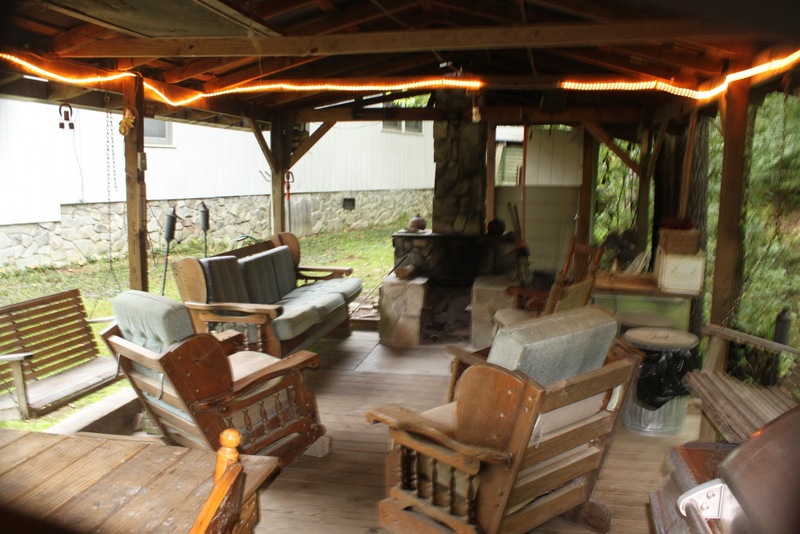 To book the best accomodations in the gorge check out our website for Brown Mountain Lodge Cabin Rentals "Click link here"
Outdoor covered lounges with fire pits, chairs, dart boards, and grills for chillaxing after a day on the river! 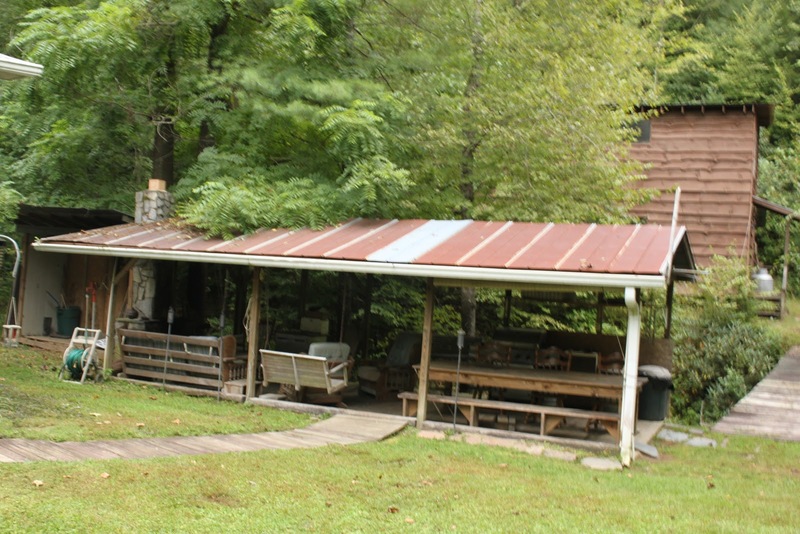 Mountain Hiking adventures for your kids is what Brown Mountain Lodge Cabin Rentals is all about. "Grand Canyon of the East"
New trail I cut out behind the BML got to cascading falls over a massive rock slab, the Mountain Laurel has since been cut back so you can see the falls better now. 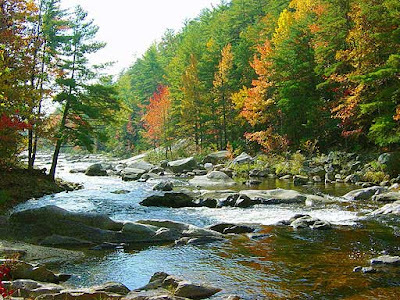 Need to know data to plan your Kayaking trip the the Wilson Creek Wild and Scenic River and Johns River in Caldwell County North Carolina. Upper portions (section 1) of this stream are technically challenging and can only be paddled during heavy rains. In sections before the gorge (section 2 & 3), low- to intermediate-skilled paddlers will find a few challenges and the occasional ledge. The gorge (section 4), being one of the more popular runs in the Southeast, should only be paddled by more experienced enthusiasts, especially after a large rain. The gorge offers several major drops with Class IV and V rapids. After the gorge (section 5), Wilson Creek can be enjoyed by intermediate paddlers with Class I to II rapids. The Johns River (Class I to II) is perfect for beginner and intermediate paddlers. It runs from the Globe area of Pisgah National Forest and joins Wilson Creek and continues on to Lake Rhodhiss, north of Morganton. 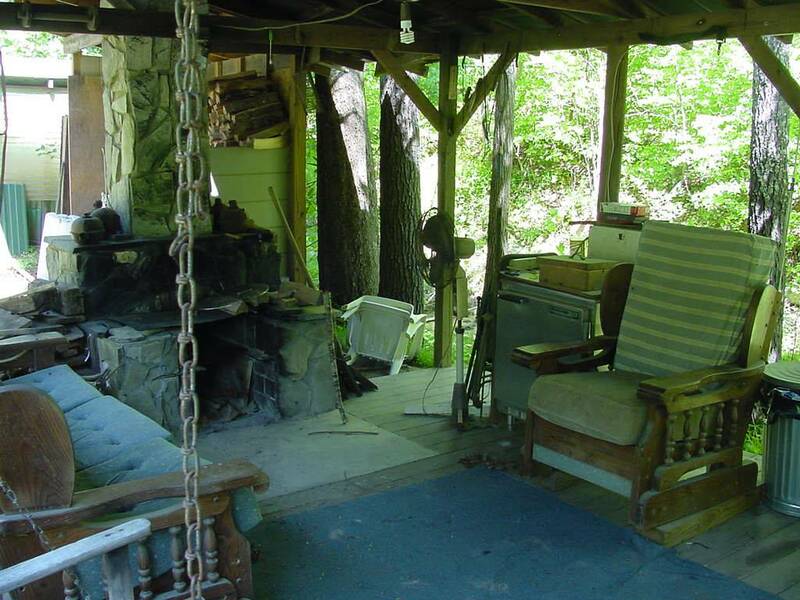 The upper portion (section 1) starts at the Johns River Camp bridge and runs through several low-water bridges and takes out at the bridge on CR 1356 southwest off NC 90. 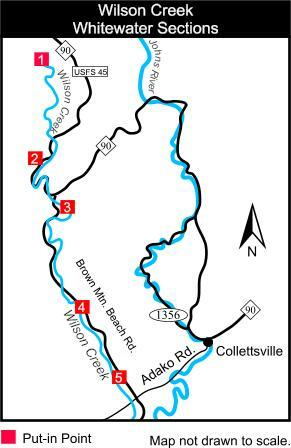 After a gap, section 2 starts at Collettsville at the Adako Road bridge at NC 90 and takes out at the beginning of section 3. In section 3, paddlers put in at the CR 1438 bridge and take out at the North Carolina Wildlife Access Area at the NC 18 bridge northwest of Morganton. Section 3: Burke CR 1438 Bridge (30 yards upstream on east bank) to NC Wildlife Access area at NC 18 bridge. Brown Mountain Lodge Pet Friendly Cabin Rentals are located in the Wilson Creek Wild and Scenic River Gorge. After a fun day on the water chillaxing by the firepit grill steaks is what its all about. Take the video head cam tour of the Brown Mountain OHV/ ATV park and see what the trails look like before your adventure! 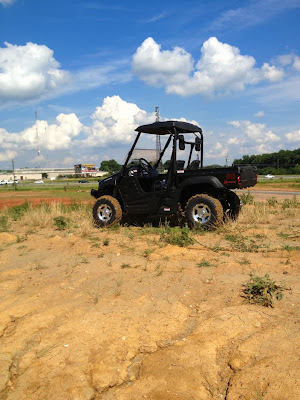 Just bought a UTV to bring up here and explore, I came last weekend and was blown away with the cool trails and sights, so far I've only explored trail # 1 but its very manageable and awesome, love the views. Bring your ATV, UTV or off road 4X4 up for some fun! Brown Mountain Off-Highway Vehicle (OHV) Area, on the Grandfather Ranger District of the Pisgah National Forest, offers 34 miles of rugged, mountainous trails with lots of challenges. The trails range in difficulty from “easy” to “difficult.” Note that the trails are color coded on the map to show their difficulty. The map also has vehicle symbols to show which trails are open to trail bikes, allterrain vehicles (ATV’s), 4-wheel drive vehicles, or all three. Mountain bikers may use trails at their own risk; the same fee is required. 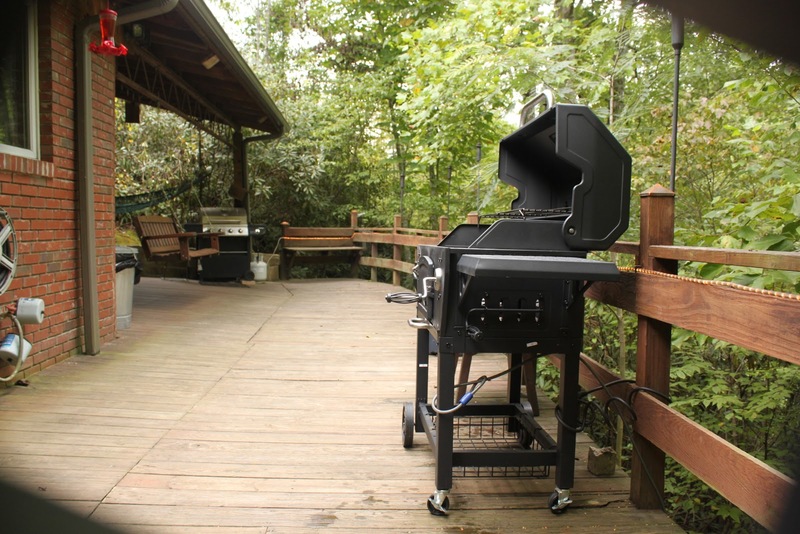 only place in Pisgah National Forest where ATV’s and unlicensed trail bikes may be ridden. On forest roads outside this area, only licensed, street-legal vehicles may be ridden. State vehicle laws are enforced on forest roads. Call Before You Haul: Due to weather conditions and maintenance, this trail may be closed on short notice. 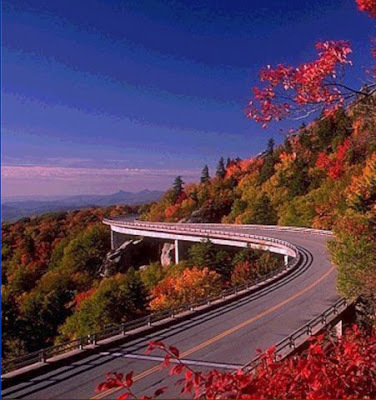 Before your ride, please call the OHV hotline at 828-652-2144. Fees: A fee is charged for use of the trail system. 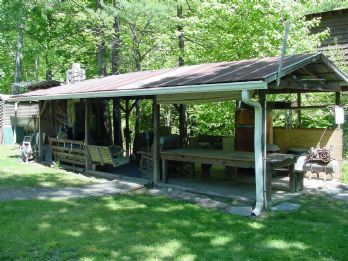 Daily or seasonal passes may be purchased at local vendors or at the Grandfather District Office at 109 East Lawing Lane, Nebo, NC 28761. The District is at exit 90 just off U.S. 40 and is open Monday through Friday, 8 a.m. to 4:30 p.m. The funds are used to maintain the trails and make improvements in the area. Season: Brown Mountain OHV Area is open this year from April 1 through January 1.
hydrant, and “sweet-smelling” vault toilet are located at the trailhead. Alcoholic beverages are not permitted in the OHV area, including in campsites or on trails. on the right at the sign. Mountain OHV Area entrance on the left at sign. The Legend of the Brown Mountain Lights in NC Mountains. 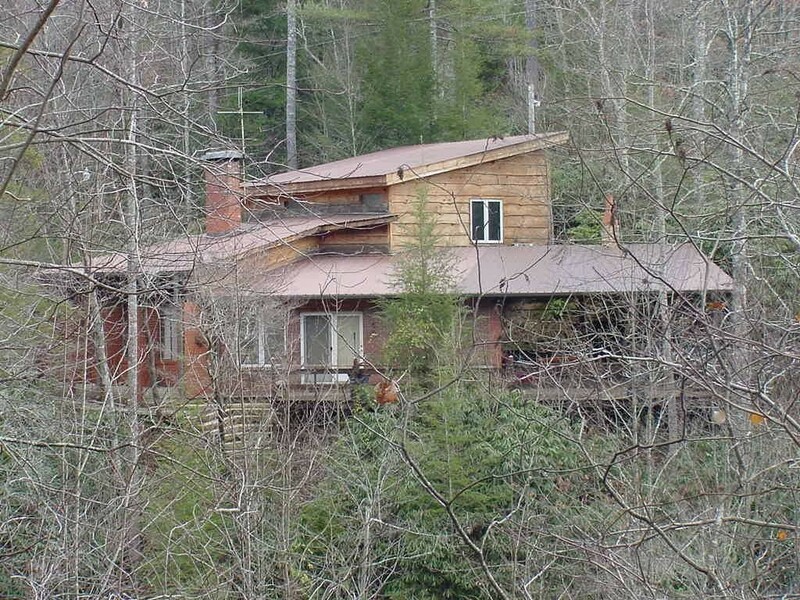 The paranormal folks and research gurus are still trying to disprove the local legend of the Brown Mountain Lights. I wrote a story about them in a ghost story book titled "Thirteen Terrifying Tales of the NC Piedmont" story #10. What I saw up close as teenager was not any kind of man made light source. 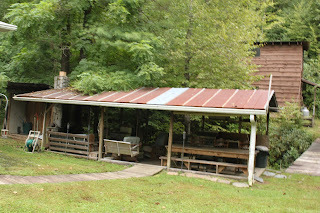 We had hiked up School House Ridge behind Mortimer campground and made camp one eve. We had our campfire and camp site set for the eve. As anyone who has hiked the Wilson Wild and Scenic River Gorge area will tell you it gets really dark when the moon isn't out. As the night settled in and we were huddled around the campfire we heard what sounded like foot steps coming up the mountain through the leaves. Leaves crunching as if it were footsteps. I've been coming up here for 40 years I was always told the Legend was Indian squaws looking for thier Braves lost in battle. We could see the 3 lights that had a irredecent multi colored glow, somewhat like the size of a lantern light approaching. These were no lanterns! Literally the lights continued to get closer and closer. We threw rocks sticks and any and everything we could find at them, they got to within 30 yds of us and vanished. Needless to say we stayed up the rest of the night to keep a look out and at sun up virtually ran down the mountain to get out of there with our lives. 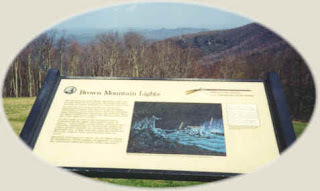 To see the Brown Mountain Lights from a distance there is a lookout on Highway 181 out of Morganton in Burke County, looking North from the vantage point is the Brown Mountain and surrounding peaks. You might get lucky enough to see them. The seasons will change this Sunday (Sept. 22), with the Northern Hemisphere moving into autumn and the South emerging from winter into spring. The celestial event that marks this transition is called an "equinox," and it happens twice every year, around March 21 and Sept. 21. Just what is an equinox, and why does it occur? Because the Earth is so big, its mass has an enormously powerful gyroscopic effect. For this reason, its poles always point in the same direction, although a major earthquake can cause tiny wobbles in this axis. Most importantly, the Earth's motion around the sun has absolutely no effect on the direction the poles are pointing, which has very important consequences for Earth's seasons. Astronomers mark the positions of objects in the sky relative to the Earth's poles of rotation (those are the red lines you see in the picture). The most important line is the celestial equator, which divides the sky into the Northern and Southern Hemispheres. The Earth's pole of rotation is tilted 23.4 degrees relative to the plane of its orbit. This tilt is always toward the same point in the sky, called the celestial pole, no matter where in its orbit around the sun the Earth happens to be. This tilt makes it appear to observers on Earth's surface that the sun is moving across the sky at an angle to the celestial equator. 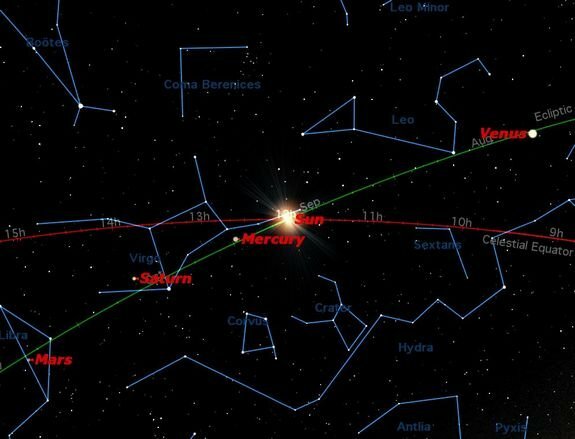 This is marked by the green line in the image, called the "ecliptic" because eclipses happen along this line. 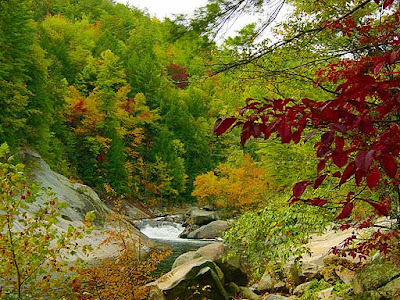 One of the most beautiful times of the year in Western North Carolina is Autumn. The mountains seem to come alive with color. People travel from miles around just to catch a glimpse of the splendor. Peak foliage viewing depends on many factors. The most important factor is elevation. Trees of the same species, can peak weeks apart depending on their location. Cooler slopes, that face the north, will peak much earlier than slopes facing the sun. Certain species of trees also peak earlier than others. In addition, an early frost and unusually wet or dry summers will affect the process differently. part of the 100,000-acre Biltmore Estate bought in the late 1800s by George W.
Our guests favor the Wilson Creek Wild and Scenic River Gorge as well for the off the beaten path and no traffic. The Brown Mountain Beach Road is hard packed gravel but is well maintained and is mostly public. There are 9 miles of River Gorge with public parking and stairs to the river. Bring your camera, the trees the leaves, the boulders and river hydraulics are amazing. Bring a fishing rod to catch some of the coolest looking fish...... a beautiful Brown or Rainbow Trout. 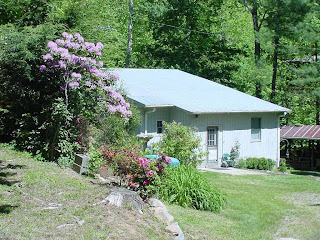 Brown Mountain Lodge and Creekside Cozy Cabin are right down the road from the The Wilson Creek River Gorge and only 13 miles to the Blue Ridge Parkway and Linn Cove Viaduct. From there you can turn left and go see the Linville Falls and turn back to the right and go across the Viaduct and make a stop at Grandfather Mountain......breathtaking. After that cap off the evening with mountain gear shopping in Blowing Rock and dinner at Canyon's Restuarant. Rock Hounds and Gems seekers like the Hiddenite and Franklin Mines for the family fun experience! I dreamed of owning Brown Mountain Lodge as a kid. 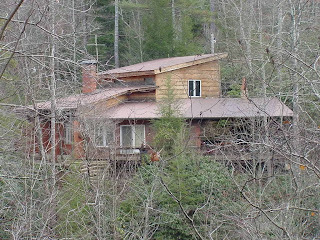 In 2000 my wife and I purchased it and began our restoration and expansion of the home to share with guests the memories and good times of the Wilson Creek River Gorge area. 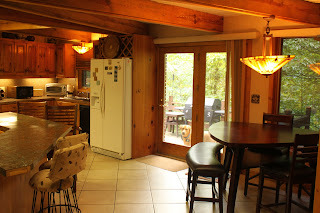 In 2010 we opened my parents home place and named it Creekside Cozy Cabin. We invite you to experience the peace and serenity of the mountains for your next vacation getaway.